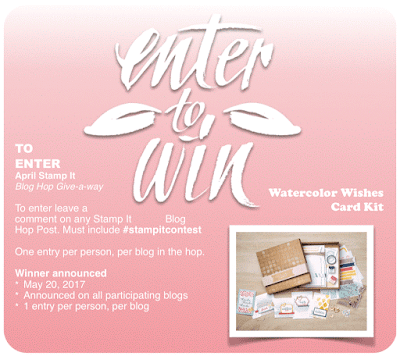 Hello my stamping friend and welcome to our April Blog Hop. The theme of this month hop is Mother's Day. I created 2 projects that are slightly non traditional for me. When I think about Mother's Day - roses are always coming in mind, big bouquet of roses. 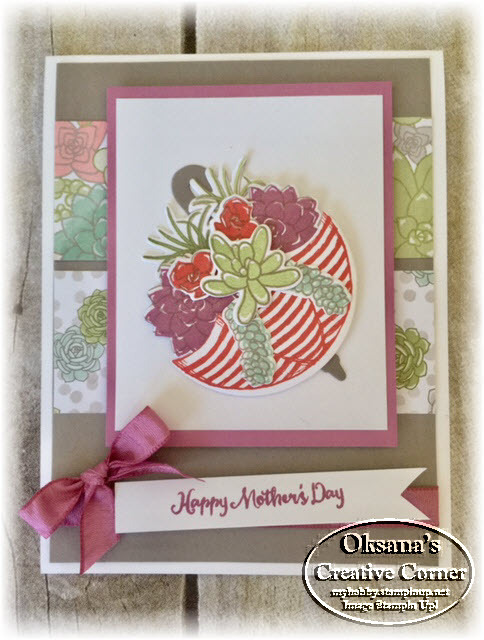 But because I used rose stamp sets many times I decided to use a set that I did not have a chance to play with and that has Mother's Day greeting in it - "Oh So Succulent". 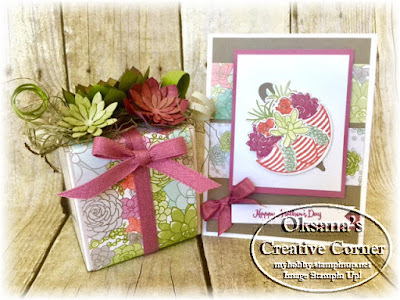 At first - I did not need the stamp set, but was super intrigued with framelits and paper flowers it creates. So I bought a bundle, but did not use it until this week. Let me tell you - I wish 2 things: could of tried it sooner and it would not be on retiring list. The only positive thing is that frameilts are on 50% discount! You will need to buy stamp set and fremlits separately to get a best deal. I used Weather Together bundle for umbrella. Outline of flowers were done in Tip Tap Taupe. I found it easier to line them up when stamping outline first. The box is 3x3 white box from Stampin Up (also on retired list). Love the size of it and how easy it can be decorated. 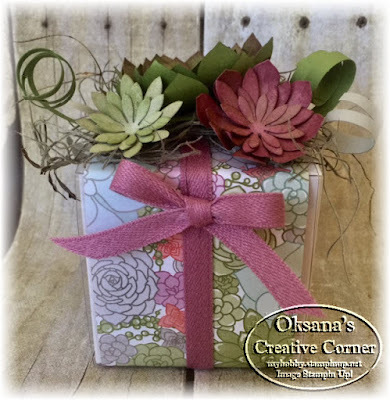 The designer paper was wrapped around clear piece and flowers and moss added to the top. And the best part is the moss. It is not from a craft store, I pooled it from the tree in my backyard. All our oaks here in Florida are covered in Spanish moss. I finally found some use of it, haha. Succulents were super easy to make. 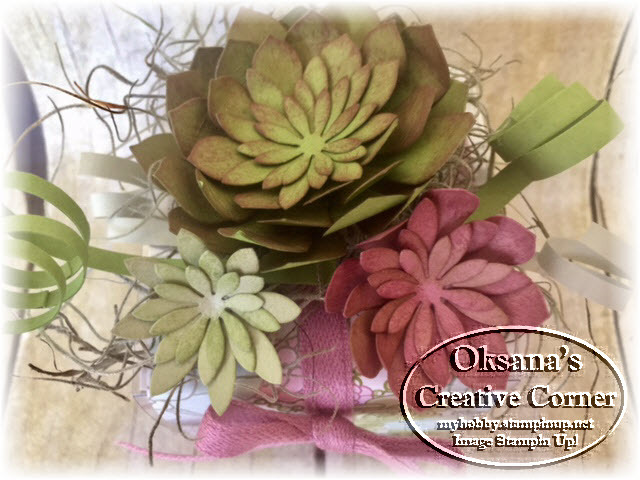 I cut all flower shapes from Old Olive card stock, sponged them in Sweet Sugarplum, curled with scoring tool and assemble. Sugarplum one - 4 smallest flower shapes, Sahara Sand - 3 smallest ones sponged with old olive ink. You can find plenty of videos on YouTube how to make them. They come together very quickly and look very cool. I also curled thin strips of card stock to add on top.